Pokémon Quest is the latest addition to the ever-expanding Pokémon game universe, available for Nintendo Switch, iOS, and Android, offering a simplistic and enjoyable adventure on Tumblecube Island. Here you'll encounter the 151 Pokémon found in the Kanto regional Pokédex (think Pokémon Red and Pokémon Blue). While the combat is nowhere near as complex as what’s offered by the mainline games, it’s still engaging enough despite its relatively hands-off nature. Here’s everything you’ll need to know about Pokémon Quest’s stat system, including how you can equip Power Stones on your Pokémon and increase their power as well as a detailed explanation of the game’s secondary bonuses. Pokémon Quest has done away with the complexities of offering six base stats for each Pokémon (HP, Attack, Defense, Special Attack, Special Defense and Speed), found in the main Pokémon games, and instead your Pokémon has two primary stats: Hitpoints (HP) and Attack (ATK). Simple enough! Your Pokémon can gain additional bonuses, such as Critical Hit Damage and Critical Hit Rate, by equipping Power Stones. Additionally, it’s worth noting that there are both close-range and long-range Pokémon, which is denoted by the battling Pokémon icon located near their HP and ATK in the “Edit Team” menus. While Pokémon Quest shows only these two stats for each individual Pokémon, there can and will be significant stat differences between multiple Pokémon of the same species. You may come across a lower-leveled Pokémon with a higher total stat distribution (HP + ATK) than one you already have. Cook better quality recipes for a chance at attracting Pokémon with higher base stats. Learn more about cooking recipes in Pokémon Quest in our guide. In addition to starting with the base HP and ATK stats which grow as your Pokémon levels, your Pokémon will also gain substantial statistical benefits through use of Power Stones and by completing Bingo Bonuses (more on that below). You can think of these as your Pokémon’s equipment, basically. Each Pokémon has a Power Charm with up to nine slots of two types: HP and ATK. When your Pokémon are lower level, many of the slots will be locked but as it levels up more slots will unlock. Make sure you’re regularly updating the Power Charms of your party Pokémon as you earn stronger Power Stones. You will regularly receive Power Stones by completing Expeditions. You’ll likely find early on that your stone storage space is inadequate to hold all the Stones you’d like to keep (they remain in the bag even when equipped), so you may need to purchase Stone Box expansions from the Poké Mart at a cost of 50 PM Tickets. Each upgrade offers an additional 20 slots, up to a maximum of 300. 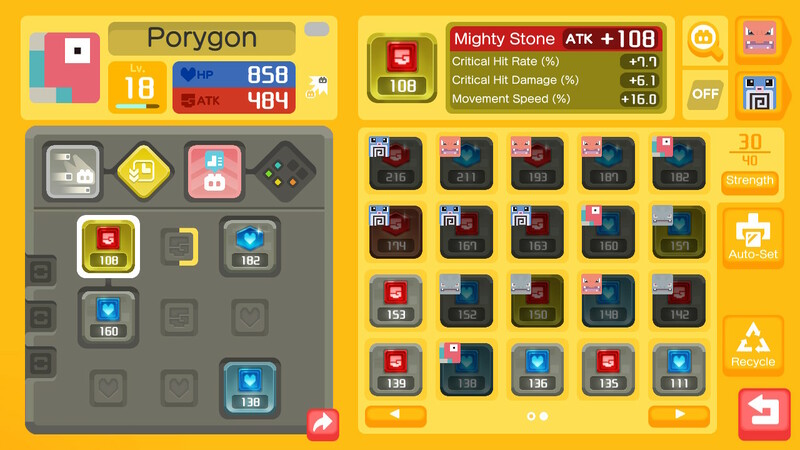 Since you can freely switch your Power Stones between Pokémon you’re using in your party and those you are not, early on it’s easiest to simply keep the Power Stones with the highest stats or best benefits to your team. In addition to providing HP and ATK stats, Power Charms can also provide additional bonuses to your Pokemon that will display as affixes to the specific stone. These stones will feature a different color border than normal stones, including bronze, silver and gold (the basic stones are grey). Bronze stones will have one additional affix, silver stones have two, and gold stones will offer three additional benefits to the equipped Pokémon. There is also a platinum stone that is awarded in the story mode and features higher stats than normal. These bonuses will increase the respective attribute of your Pokémon by the specified percent. It may sometimes be beneficial to use a Power Stone with a lower base stat number that offers substantial secondary bonuses. Critical Hit Rate: Increases your Pokémon’s chance to land a critical hit. Caps at 100%. Natural Healing: Your Pokémon will gain passive HP regeneration during Expeditions. Caps at 300%. Hit Healing: Your Pokémon is healed by a percentage of its damage dealt. Caps at 10%. Healing from K.O. : Your Pokémon will recover a percentage of its health when it K.O.s wild Pokémon. Caps at 10%. Time to Recover: Your Pokémon will recover faster from a K.O. Caps at 50%. HP upon Recovery: Your Pokémon will recover from a K.O. with more HP. Caps at 50%. Resistant to Status Conditions: Increases your Pokémon’s chance to resist status conditions such as Poison or Paralysis. Caps at 100%. Movement Speed: Increases your Pokémon’s movement speed during Expeditions. Caps at 200%. Poliwag's Strength menu is shown, detailing bonuses earned by Stones (Power and Move). Notice he also has a Bingo! You can view all of these bonuses by tapping on Edit Team, then the desired Pokémon. Tap the the Power Charm menu located at the top right of the screen, then tap the magnifying glass located next to the portraits of the rest of your team, which is up in the right corner as well. 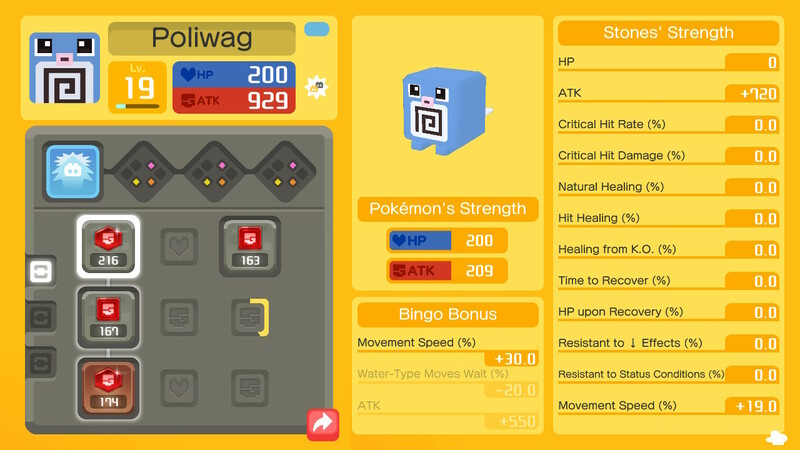 Each Pokémon you obtain has the possibility of earning Bingo Bonuses by socketing Power Stones in specific slots of their Power Charm which are connected by a thick grey line. Two Pokémon of the same species will not always have the same Bingo Bonuses, so if you have multiple of the same Pokémon, it’s preferable to choose the one with more beneficial bonuses. In order for a Bingo Bonus to be earned, you must fill three connected slots that are in the same row or column. Diagonal sets of three will not count. A Pokémon’s Power Charm slots will unlock as they grow in level, and you can tell which one you’re on your way to unlocking because it will feature a yellow progress bar gradually filling in the border. You’ll earn the first Bingo Bonus upon completing one Bingo, the second upon completing two lines, and the third once you have connected three sets of three slots. Additionally, a Pokémon’s Bingo Bonuses may change when it evolves, which can potentially be unlucky. 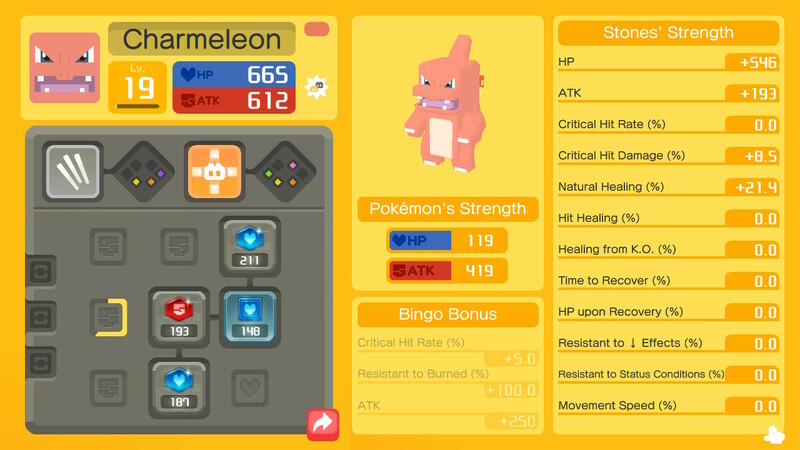 Despite filling connected slots, Charmeleon does not earn a Bingo Bonus because he lacks that three in a row. In addition to Bingo Bonuses offering the same benefits that are found on Power Stones, such as Critical Hit Rate and flat bonus ATK, they can also feature additional bonuses not available on Power Stones, including resistance to specific status effects, and many Move type-specific bonuses that can reduce damage taken from specific move types as well as increase the power of your Pokémon’s moves. Water-Type Moves Wait (%), for example, will lower the cooldown of your Pokémon’s water type moves. There are also bonuses that are not specific to moves or base stats and instead offer benefits to your Pokémon’s actions on the map, such as a reduction to knockback taken from wild Pokémon moves or increased damage for type-specific moves. It’s worth noting that, currently, any bonuses earned by completing a Bingo Bonuses are not added to the Pokémon’s current percent for that bonus in the strength panel. This means if you earn, for example, a 30 percent bonus to your Critical Hit Damage through a Bingo Bonus, but have only a 10 percent bonus from a Power Stone, the strength panel will display that bonus’ value as only 10 percent (even though it is certainly 40 percent). Don't worry—you're definitely getting those bonuses! You cannot surpass any bonus’ cap even with a Bingo Bonus, so you’ll want to make sure that if you’re getting close to capping a bonus, you aren’t wasting any bonuses on Power Stones that may be more beneficial to another Pokémon in your party. As with most Pokémon games, your Pokémon will gain experience through battling—in this case, by defeating Pokémon they encounter during Expeditions. Upon completion of an Expedition, even your your Pokémon have fainted or you were unable to successfully defeat the Expedition’s boss, all Pokémon that have participated in the Expedition will gain experience, but will forfeit any ingredients they have obtained. You can choose to spend PM Tickets to keep the ingredients you would have received had you successfully completed the Expedition. Another way of earning experience for your Pokémon is by participating in Training. Training is accessed by tapping the “Edit Team” button then tapping “Training” located on the right side of the screen. This will open the Training menu which allows you to select a Pokémon to receive training by dragging it into the top slot, then selecting at least one Supporting Pokémon and dragging it to one of the bottom slots. You can select up to four Pokémon per training session. The more Pokémon you train with, the more experience your selected Pokémon will gain. If you select Supporting Pokémon of the same type as the Pokémon you wish to level, they will award more experience. 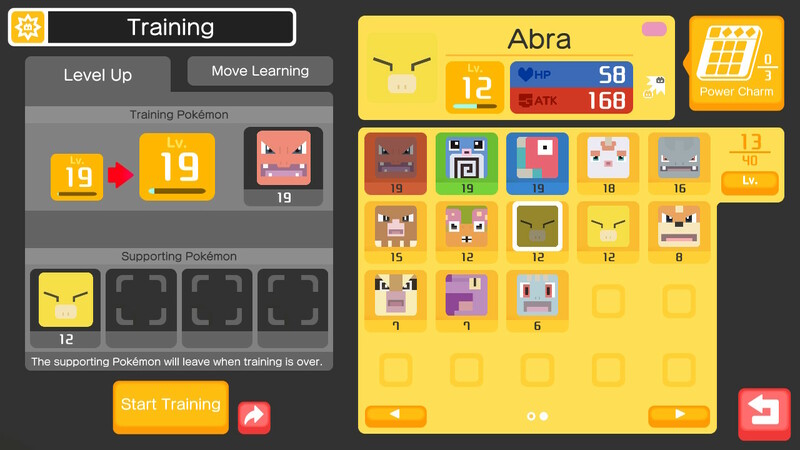 Unfortunately, an Abra were hurt to bring you this screengrab. It’s extremely important to note that selecting a Pokémon for training will completely remove the Pokémon from your collection. Presumably, your Pokémon ate them, or something equally as morbid. We can’t blame them for not wanting to beat on like that—they just came for the food! That’s all you need to know to understand the basics of improving the stats and bonuses of your Pokémon team!